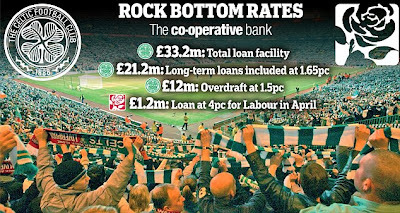 The Co-operative Bank has come under fire for dishing out £33.2million in cheap loans and overdrafts to Celtic Football Club, which was chaired by former Labour home secretary John Reid. MPs last night demanded an explanation for the rock bottom interest rates and accused the mutual of using the ‘hard-earned cash of millions of savers for political gain’. It is the latest twist in the row over the troubled lender’s links with the Labour Party. Glasgow-based Celtic was chaired by Lord Reid, the former home secretary under Tony Blair, between 2007 and 2011. Labour’s former energy minister Brian Wilson joined the Celtic board in 2005 and remains a director. Insiders said the loan pre-dates both Wilson and Reid’s arrival at the club. But Celtic has long-established links with Labour, which has controlled Glasgow City Council since the 1970s. 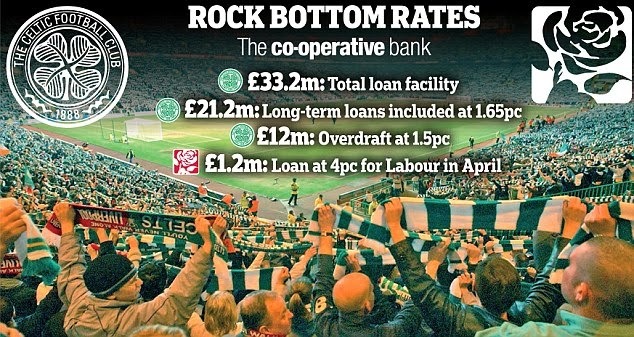 The latest company accounts for Celtic show it has a £12million overdraft facility charging an average of 1.5 per cent over the year to June 30 2013. This is based on one percentage point above the Bank of England’s base rate, which is currently 0.5 per cent. The remainder is made up of a £21.2million long-term loan, with an average rate of 1.65 per cent. This makes even Labour’s recent £1.2million cheap loan at 4 per cent – or 3.5 per cent above Base Rate – look expensive. Co-op’s hugely generous terms once again highlight the close links between the scandal-hit lender and the upper echelons of the Labour Party. The political connection has come under the spotlight after former Labour councillor and former Co-op Bank chairman the Reverend Paul Flowers was caught out allegedly organising drug-fuelled orgies with rent boys. The first deadline to vote on a rescue package to plug a £1.5billion black hole in the lender’s finances falls at 4.30pm on Friday. The Co-operative Party, the political wing of the Co-op, is the sister party of Labour. In order to help shore up its finances Co-op Bank stopped lending to small firms in May. Celtic fans putting "lives at risk"